The big feast has come and gone, and even though you sent your guests home with massive amounts of Thanksgiving leftovers, your refrigerator is still bulging with containers of mashed potatoes, gravy, turkey, cranberry sauce, stuffing and miscellaneous vegetables. Time for inspiration. 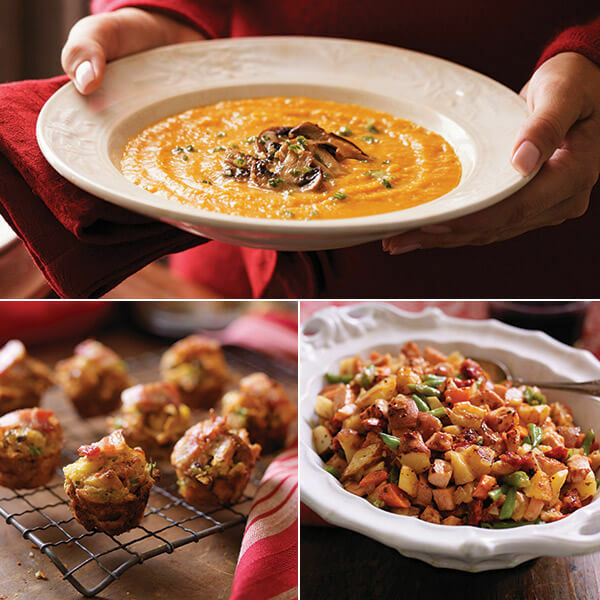 Give your Thanksgiving leftovers a tasty makeover with these 4 delicious recipes. To serve this soup as a main course, stir in some leftover roast turkey or ham to make it more substantial. Tip: If you had baked sweet potatoes (instead of mashed) for your holiday meal, you’ll need 3 to 4 medium potatoes to get 3 cups of mashed. If you don’t have a gem pan, you can make this recipe in a regular 12-cup muffin tin (with smallish cups). Use the same amount of stuffing per muffin cup, and make more than one batch. The best vegetables to use in this dish are fairly sturdy ones (like potatoes, carrots, green beans and broccoli). If you want to add vegetables that are in a sauce, use the sauce in place of—or in addition to—the gravy called for. It doesn’t matter what type of cranberry sauce (whole berry or jellied) you use for this recipe, but a cooked sauce is a better option than a raw relish.